There may be several reasons for making your own chocolate bunnies. One is that you can make it in the style and size you want. This is an easy project that takes minimum hands-on time. Because the form for the bunny is made with scrap polymer clay, you can use household objects to create a face on the bunny if you choose. Circle cutters could create eyes and thin knitting needles or toothpicks will sculpt out bunny face features. Find a free bunny image outline you like online and use it for your model. The best reason for making your own bunnies is you can use sugar free chocolate for those with dietary restrictions or if you simply want to limit the sugar intake of your little ones. I use the dark chocolate sugar- free chocolate from Trader Joe’s. Whatever kind of chocolate you choose, have fun with this project. step 1 - Search for a bunny image on Google using the words “bunny stencil”. Size and print out the image on card stock. Cut out the image. Roll out scrap polymer clay to about 1/8” thick. Place it on parchment paper. Use the card stock to cut the image into the clay with a craft knife (A). Cut out a second clay image (B). To remove the parchment from the clay turn it over onto bakers plastic and roll the parchment off the clay (C). Pulling it straight up may stretch the image. Stack the second image on top of the first. (D). If you care to, sculpt a bunny face into the clay with simple tools like a knitting needle. Bake the joined bunnies in a 275 degree oven for 30 minutes. Allow to cool completely. step 2 -Make a chocolate mold from the clay bunny using Amazing Mold Putty. Follow the instructions on the package for mixing the yellow and white material (A( to form a pale yellow. Cover the bunny and allow the mold to set for 30 minutes or more (B). Be sure to wash the mold with warm soapy water before using it. step 3 - Melt chopped chocolate or chocolate chips in a microwave oven for one minute on medium setting. Stir and microwave for 30 seconds on the same setting. Be aware that oven temperatures vary and so may the results. Let the chocolate cool for ten minutes then pour it into the mold. Do not fill the mold up to the edges which will make it more difficult to remove later. Put the mold in the freezer for 15 minutes. Remove it and let it rest for about ten minutes or until the mold easily removes from the chocolate. 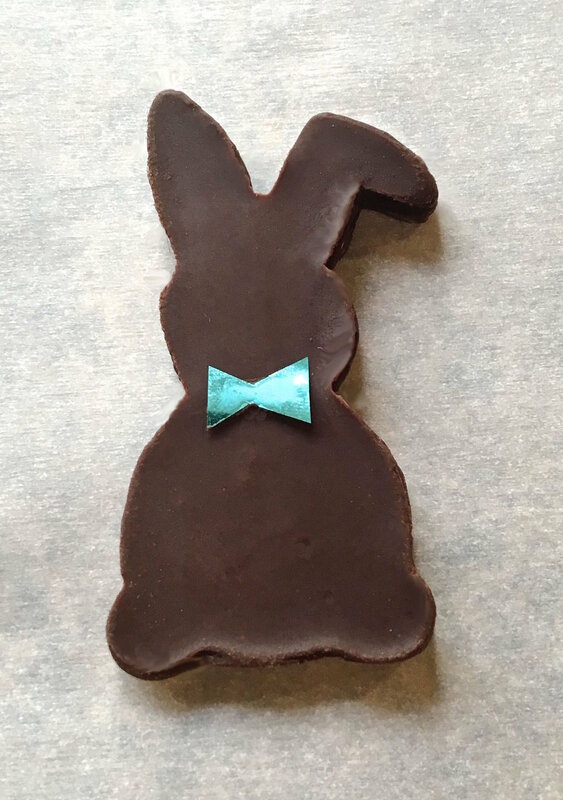 Cut a little bow tie from colored foil and attach it to the bunny with melted chocolate on a toothpick. Keep bunnies in the refrigerator until serving. The image you find online may be copyright protected. It is your responsibility to determine if it is in the public domain and if you can legally use it.